A total of 97 artists from 31 countries, including 36 Indians will showcase their creative oeuvre at KMB 2016. 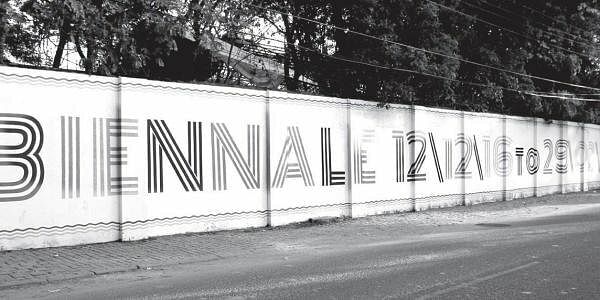 KOCHI: The stage is set for the third edition of Kochi Muziris Biennale(KMB)-- the largest and most anticipated celebration of contemporary art in South Asia-- which will get under way at Fort Kochi on Monday. Chief Minister Pinarayi Vijayan will officially launch KMB 2016, at a function to be held at the Parade Ground in the evening. Curated by renowned artist Sudarshan Shetty, the latest edition of the cultural extravaganza titled ‘Forming in the Pupil of an Eye’, a line from Sharmista Mohanty’s work, will be on till March 29, 2017. A total of 97 artists from 31 countries, including 36 Indians will showcase their creative oeuvre at KMB 2016. And eight out of the 36 Indian artists featured in KMB 2016 are from Kerala. The line-up is a mixture of styles, disciplines and sensibilities, with writers, dancers, poets, musicians and theatre professionals sharing the Biennale space alongside a host of visual artists. “The KMB is fortunate to enjoy the full backing of the Government of Kerala. We are honoured to have Chief Minister Pinarayi Vijayan inaugurate the third edition of what has become a Keralite institution. We look forward to welcoming the public to the Biennale over the next four months,” KMB president Bose Krishnamachari told a presser in Kochi on Saturday. The exhibition which will be held across 12 venues in Fort Kochi-Mattancherry and Ernakulam will also have Students’ Biennale, conversations, discussions, seminars, Art By Children and the Pepper House Residency exhibitions, workshops, Artists’ Cinema and music sessions. “ Kochi is today a pilgrimage site for art. Our stated mandate, as the People’s Biennale, is to take art to the public and to make more art spaces more inclusive. The KBF is the biggest art organisation in India to be officially empanelled to receive funding for education initiatives. The only way to thank the Government of Kerala, our highly committed corporate, cultural, diplomatic and individual patrons and partners is to keep on getting better,” said KBF secretary Riyas Komu, who along with curator Sudharshan Shetty , KBF CEO Manju Sara Rajan and KBF Trustees, including Sunil V and Bonny Thomas attended the joint presser. Aspinwall House, Cabral Yard, Pepper House, David Hall, Durbar Hall, Kashi Art CafÃ©, Kashi Art Gallery, M A P Project Space, Anand Warehouse, T K M Warehouse, Cochin Club and Kottapuram Fort-- which has been included this year-- are the major venues for the 108 day-long contemporary art festival.